Very large bird with a huge bill equipped with a pouch of skin. Adult: plumage white with yellowish or fleshy tones during the breeding season. Bill-pouch greyish-yellow, but brighter in the breeding season. Legs yellowish-pink, becoming more reddish while breeding. Iris dark red surrounded by a flesh-coloured area of bare skin. In flight, the Great White Pelican shows the same contrast on the underwing as a White Stork: the black remiges contrast with the white coverts. Juvenile: rather dark brown on the upperparts, head and neck. Dirty white on the underparts. Legs and bare skin around the eyes flesh-coloured. Bill-pouch yellowish. In flight, seen from below, dark remiges and brownish underwing coverts with a paler central area. Voice: humming and growling calls are heard at the colonies. L. 140-175 cm ; W. 245-295 cm. Similar species: Dalmatian Pelican, Pink-backed Pelican. Slightly larger on average than the Great White Pelican. Adult: distinguished from the Great White Pelican by the curled feathers on the nape, the grey legs, the grey-tinged plumage, the narrow ring of pale skin around the eye and the reddish bill-pouch. In flight, the underwing is greyish-white with a whiter central panel, looking all pale with only the tips of the flight-feathers darker. Juvenile: grey-brown above and dirty white below. Slightly paler than juvenile of Great White Pelican. Bill-pouch yellowish. Legs grey and skin around the eye greyish-white. Voice: like that of the Great White Pelican. L. 160-180 cm ; W. 270-320 cm. 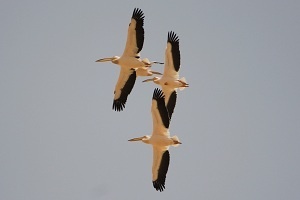 Similar species: Great White Pelican, Pink-backed Pelican. The smallest of the three pelicans. Plumage appears pale dirty grey overall, with a pink tinge on the back and underwings. Dark mark in front of the eye. Adult: the skin of the bill-pouch is greyish-yellow in the non-breeding adult and orange-red in the breeding adult. 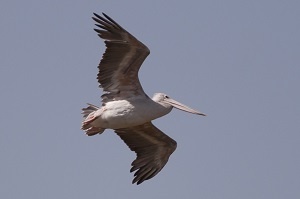 In flight, shows the same contrast as the Great White Pelican (although the remiges are not so dark) with a broad pale central bar and pink axillaries. Legs pink. Juvenile: brownish like juvenile of Great White Pelican. Bill-pouch and legs flesh-coloured. L. 125-135 cm ; W. 225-260 cm. Similar species: Great White Pelican, Dalmatian Pelican.